Literacy Through Photography will be here Monday, June 18th! There will be a 1:30 pm and 3:00 pm session for elementary students. There is limited seating. We will start stamping hands 30 minutes before the show. Puppet Pizzazz will be at Maud Marks on Monday, June 11, 2018. There will be a 1:30 pm and 3:00 pm performance. School age children will need their hands stamped in order to gain admission. The Genre Challenge Has Returned at the Maud Marks Library for Summer 2018. 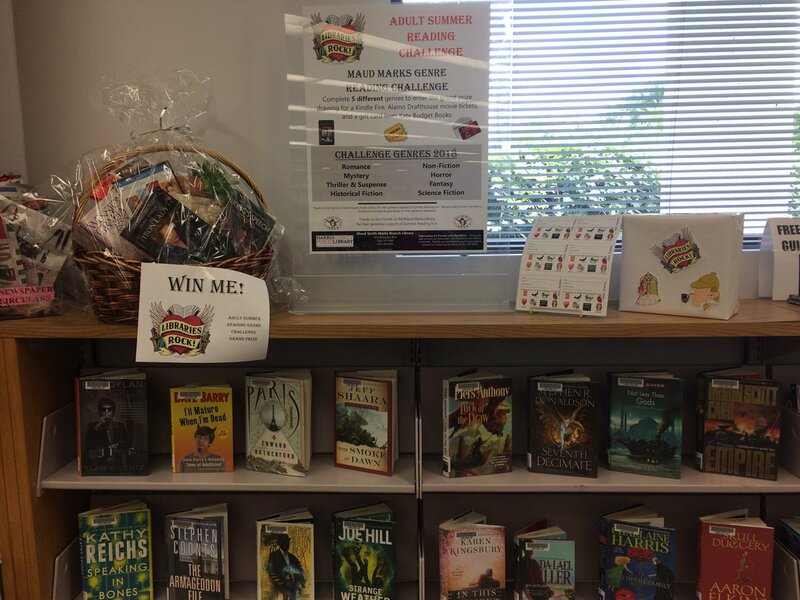 The way this works, you read books in different genres and then turn in slips to be entered in for drawing for various gift baskets. If you read 5 different genres over the summer, you will receive an entry for the grand prize basket. This basket includes a Kindle Fire, a $25 gift certificate to Katy Budget Books, and 4 tickets to the Alamo DraftHouse movie theatre. Monday, June 4, 2018 is the first day of HCPL's Summer Reading Program. Come see some cute animals and help Maud Marks Library kick off SRP 2018! Marsha's Petting Zoo will be here June 4th from 1:30 pm to 3:30 pm.